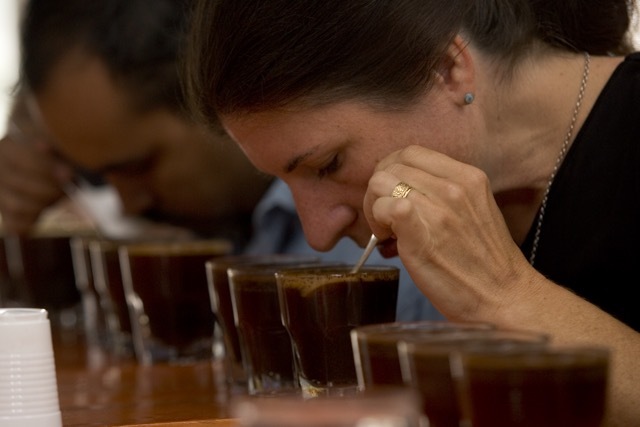 We at Sustainable Harvest® have long been aware of Lindsey Bolger’s importance to the coffee industry. I met Lindsey nearly 20 years ago: As a green buyer for Batdorf & Bronson, she was one of my very first customers in specialty coffee. But over the last two decades we’ve witnessed her incredible dedication to transforming farmers’ lives through her passion to find quality coffee and to share her learnings with smallholder farmers. While it might not seem like the most obvious link to improving farmers’ livelihoods, in actuality, Lindsey’s global efforts to develop a common sensory language throughout the supply chain have made a huge difference in the incomes of tens of thousands of coffee growers. This is just one of the many accomplishments that have established Lindsey as an industry leader. The entire global team at Sustainable Harvest® was extremely happy to see Lindsey recognized last week with the Coffee Quality Institute’s 2015 Leadership Medal of Merit. She received the award at the CQI Luncheon, held during the Specialty Coffee Association of America (SCAA) Event in Seattle. I had the opportunity to attend and watch Lindsey receive the honor in person. For the event, Sustainable Harvest® was asked to provide some historical background to all those attending the festivities who may or may not be as familiar with Lindsey’s achievements. So we had our Story Team produce a video for the CQI Luncheon, featuring many clips from the two decades of footage in the Sustainable Harvest® digital archives. I need to give a lot of credit to video producer Brian Kimmel and the Sustainable Harvest® Story Team, which took the time to help select archival clips, interview many of Lindsey’s longtime colleagues, and find additional footage and slides. From that they put together a video that both covered Lindsey’s many achievements and captured her spirit. In case you didn’t see it, here is the video. We’re proud to have had the opportunity to say thank you to Lindsey in a historical, visual way. We’d love to have you recognize Lindsey’s quality- and farmer-focused achievements by sharing the video through your own networks and social media channels.